In class on Monday we had a charette for a few hours to quickly ideate 3 floorplan partis. Because my project has three floors, I was only able to fully produce 2 partis that communicated my projects concept. Unity is key in the dance academy’s facility and this will be done through implementing smaller concepts of movement and transparency. The two sets of partis show not only the relationship within each floor, but the relationship between all three floors. 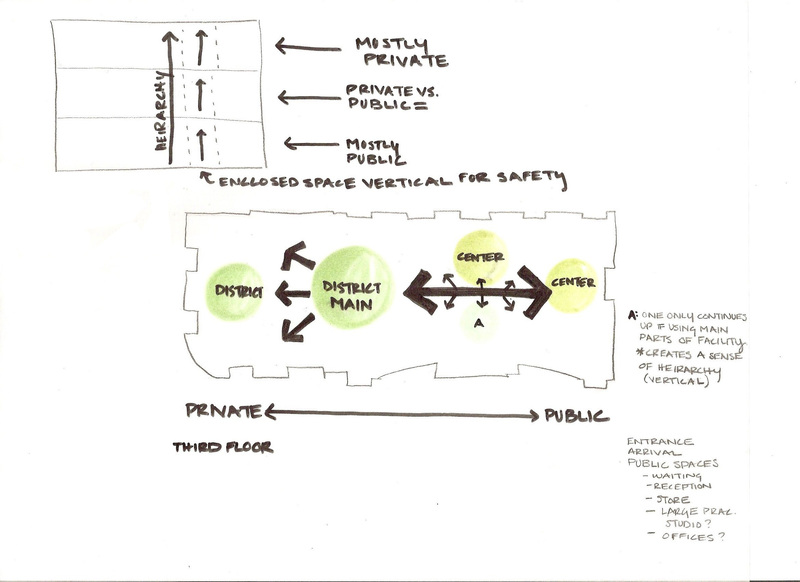 The mostly public spaces are on the arriving floor (third). The dance merchandise store, main waiting area, performance studio, and administrative offices are on this floor. The purpose being that as dancers, dancers guardians, and other guests arrive, they would not have to go further than the first floor of the dance academy. A mixture of public and private spaces are on the fourth floor. This was done to communicate the concept of unity by bringing everyone together on the middle floor. Waiting areas, dance studios, the cafe/lounge, and locker rooms are located on this level. The fifth floor is mostly private housing other dance studios, the make up room, waiting areas, etc. These spaces are located on the top floor making them the most private. The first set of sketches show a hierarchy of paths which is not shown in the second set. The space is not completely filled in the first set, however. Also, the spaces in the first set differ from the second set in that they are mirrored. What is on the third floor in the first is now on the fifth floor in the second. 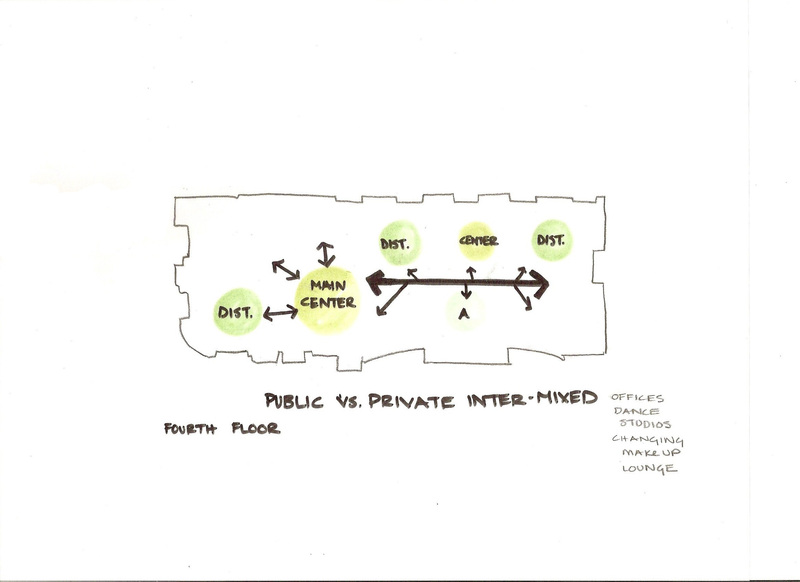 The third floor in the second set of ideation sketches holds the most private spaces. 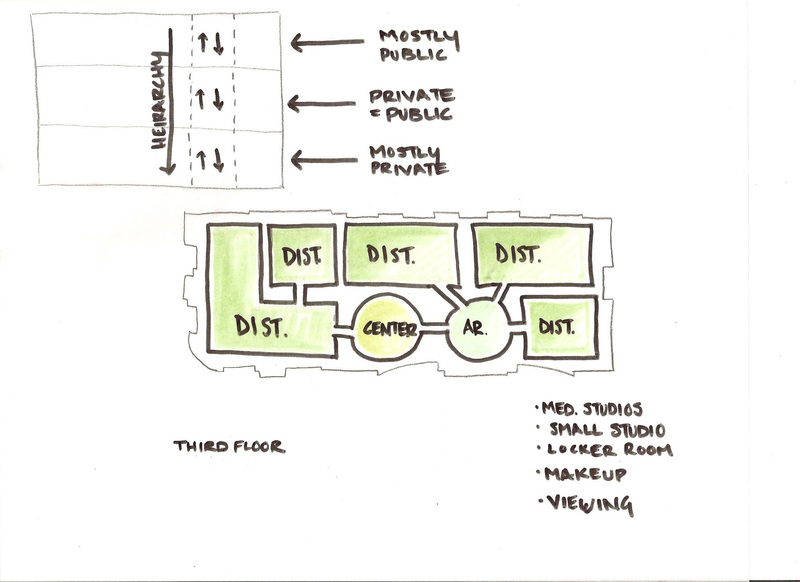 The third floor houses a medium size studio, a small studio, the locker room, makeup room, and viewing spaces. A concern was brought up by a professor about privacy and how to manage that when dealing with the arrival space to each floor. 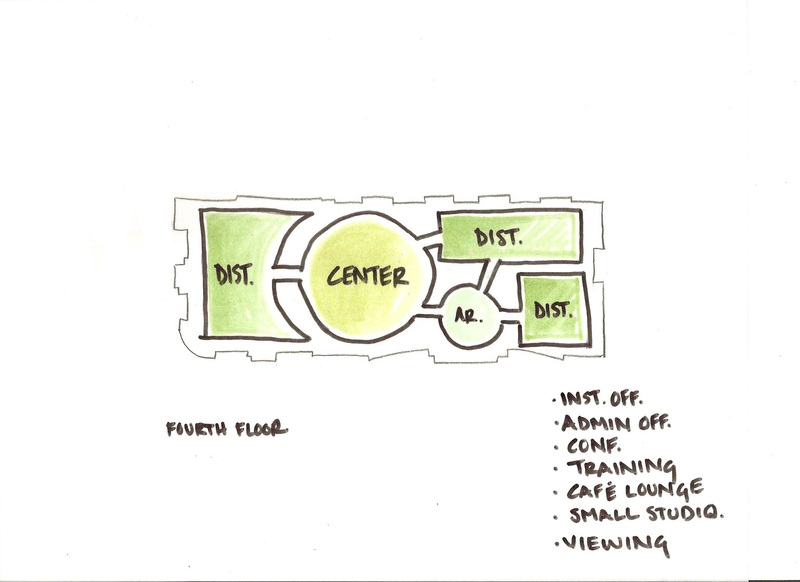 The arrival space will be an enclosed area that guests will travel through on each floor. By doing this, it creates it’s own space separate from the dance academy which regulates pedestrian traffic. The second floor of the academy (the fourth floor) holds the instructor offices, administration offices, conference room, medical training room, cafe/lounge area, a small studio, a medium studio, and viewing spaces. This floor brings together public spaces from the fifth floor and private spaces from the third floor and becomes a communal area where the users can unite and enhance relationships. 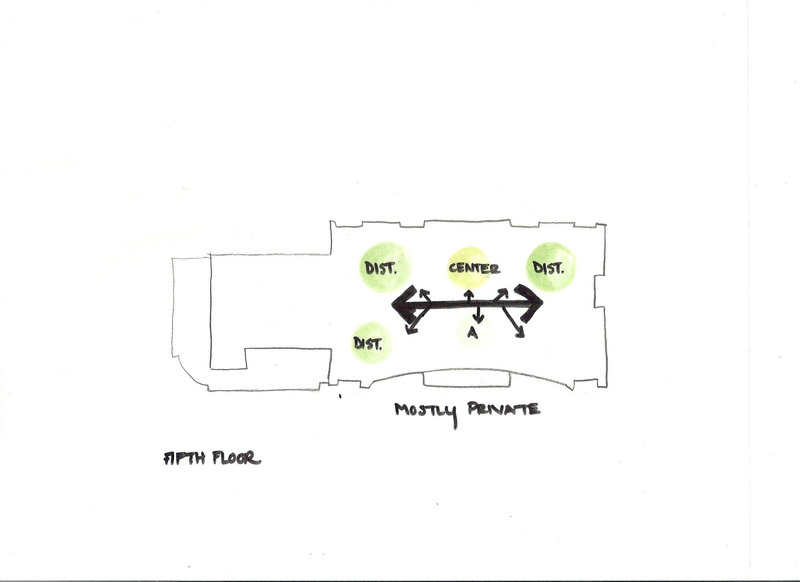 The fifth floor holds the large performance studio where not only large practices take place, but also small performances can be done and watched. It also holds a lobby/reception space, waiting area, apparel store and gift shop, and viewing areas. A concern was brought up that it was awkward to have the apparel store on the third floor of the academy and whether that would be optimal for the users or not. The stores main purpose is to provide a place for the dancers to purchase the required apparel and shoes for dance practices. Having the store on site makes it easy for the parents or guardians to make a quick purchase right before or after class. Having it on the third floor of the academy next to the large performance studio also allows small gift-like products to be sold for people to purchase who have come to watch a performance. Now onto block plans which will be shown and discussed in my next post! 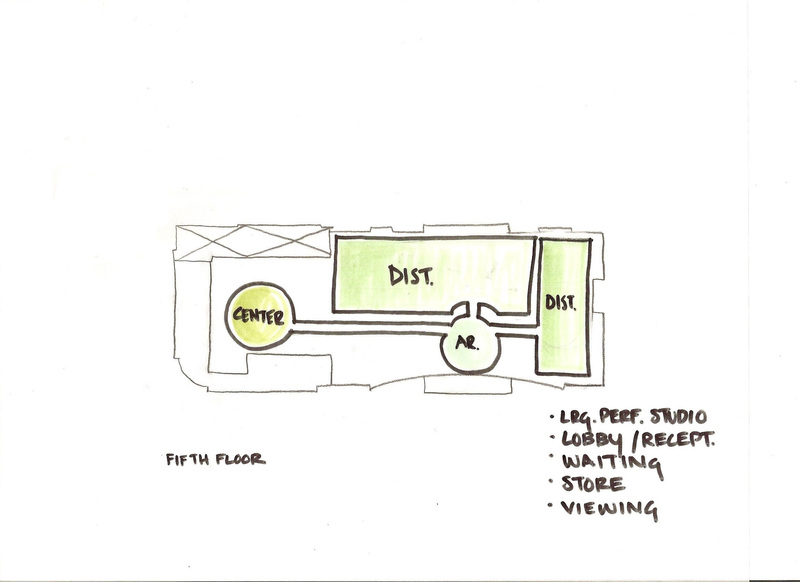 I still really like your first parti sketches which have the public spaces on the 3rd floor. However, I appreciate that you have analyzed both ways in order to come up with the best design. I look forward to what your block plans look like!